A Duravit 2nd Floor rectangular bath presents itself in a striking way in contrast to its simple design. The Duravit 2nd Floor bathtubs ensure a particularly lying comfort: a cover made of white sanitary acrylic covers the drain. Design your bathroom more cozy and complete your Duravit 2nd Floor bath with a front panel, this is for example also available in real wood veneer. The Duravit 2nd Floor baths are available as built-in or free-standing bath tub. Experience for yourself the fascination of Duravit 2nd Floor bath tubs in our shop. 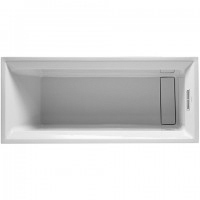 Even the matching Duravit 2nd Floor accessories such as Duravit 2nd Floor waterfall bath inlet, Duravit 2nd Floor tray support and Duravit 2nd Floor front cladding can be found in this section.